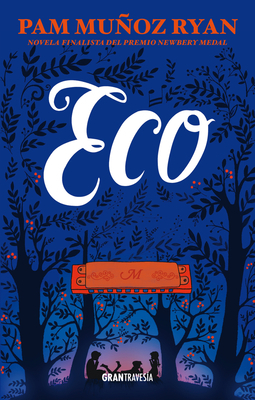 Eco (Paperback) | River Dog Book Co.
Otto is lost in a forbidden forest when he suddenly encounters three mysterious sisters. At that moment, his destiny becomes linked to the unusual search that involves a prophecy, a promise, and a harmonica. Decades later, Friedrich in Germany, Mike in Pennsylvania, and Ivy in California become interwoven when the same harmonica reaches them. These children will face major challenges: rescuing a parent, protecting a sibling, and keeping a family together. Richly imagined and masterfully crafted, Echo pushes the boundaries of genre, form, and storytelling innovation to create a wholly original novel that will resound in your heart long after the last note has been struck. Pam Munoz Ryan is the author of the New York Times Best Seller, Echo, a 2016 Newbery Honor Book, and winner of the Kirkus Prize. She has written over forty books for young people and is the author recipient of the NEA's Human and Civil Rights Award, the Virginia Hamilton Literary Award, the Willa Cather Award, the Pura Belpre medal, the PEN USA award, and many others. Her novels include Esperanza Rising, Riding Freedom, Becoming Naomi Leon, Paint the Wind, and The Dreamer.